We present the first positive obfuscation result for a traditional cryptographic functionality. 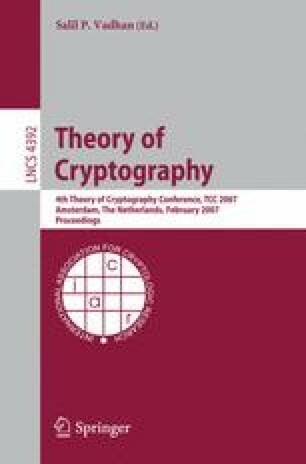 This positive result stands in contrast to well-known negative impossibility results [BGI + 01] for general obfuscation and recent negative impossibility and improbability [GK05] results for obfuscation of many cryptographic functionalities. Whereas other positive obfuscation results in the standard model apply to very simple point functions, our obfuscation result applies to the significantly more complicated and widely-used re-encryption functionality. This functionality takes a ciphertext for message m encrypted under Alice’s public key and transforms it into a ciphertext for the same message m under Bob’s public key. To overcome impossibility results and to make our results meaningful for cryptographic functionalities, we use a new definition of obfuscation. This new definition incorporates more security-aware provisions.